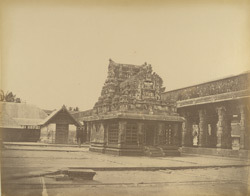 Photograph taken about 1900 by the Government photographer, Zacharias D'Cruz of the Chathan Kovil in Trivandrum. It is one of 76 prints in an album entitled 'Album of South Indian Views' of the Curzon Collection. George Nathaniel Curzon was Under Secretary of State at the Foreign Office between 1895-98 and Viceroy of India between 1898-1905. The Chathan is the chief malevolent deity, 'a low-caste demon who delights in mischief-making, such as pelting stones, breaking pots in houses, throwing dirt inside rooms or on victuals, tearing off or burning valuable clothes, setting fire to houses, untying and letting loose cattle from the stalls, causing vessels to knock against one another and breaking them, producing hideous noises and committing a number of similar nuisances. It is only low-caste people who seek the aid of this and other evil spirits'.